The UK’s annual National Ferry Fortnight starts next Saturday (2 March). Now in its fifth year, the campaign has been growing steadily since launching in 2008. Supported by the 13 ferry line members of DiscoverFerries.com, the two-week showcase was created to heighten consumer and media awareness of Britain’s extensive ferry services covering more than 50 routes. Central to the campaign is a series of promotional offers on ferry routes to Belgium, Denmark, France, Holland, Ireland, Spain, the UK including the Isle of Wight and the Scottish islands; and also the Channel Islands and Isle of Man. This year, National Ferry Fortnight urges ferry operators and passengers alike to get “ferry familiar” and encourages consumers to experience the ease, value and flexibility of ferry travel. More than 34m passengers travel by ferry annually and ferry companies have invested millions in modern, versatile fleets and upgraded services. With spas, First Class lounges and fine dining restaurants onboard some ships, “Discover Ferries” says that now is the time for passengers to jump onboard and discover the new face of ferries. 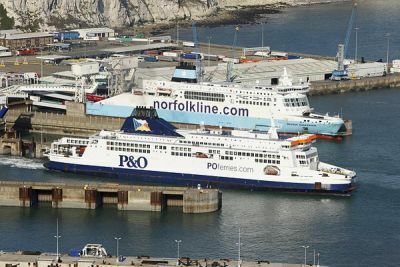 “Britain’s ferry services offer a reliable and flexible way to travel and represent great value”, said PSA Director Bill Gibbons. “We’ve chosen the new theme ‘ferry familiar’ to encourage even more people to get onboard and try ferry travel for the first time – having sailed once, we’re sure they will see the great benefits of ferry travel which include no hidden costs. National Ferry Fortnight offers a real showcase for our industry to highlight the huge investment that has been committed to providing a relaxed and versatile way of travel, particularly for families in their cars”. Dr William Baker, an Englishman, is Presidential Research Professor of English at Northern Illinois University and an expert on 19th-century British literature. He is also a keen cruise fan and not afraid to give some honest views. Let us hope that Azamara reads this report. He sums it up at the end. 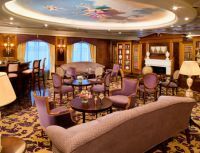 Cruising with Azamara Club Cruises, an up-market part of the Royal Caribbean Group, is fashionable. 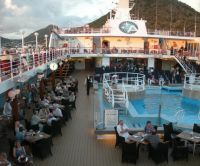 There were a number of repeat passengers on our 14-day Azamara Journey (30,000 tons R Class ship 694 passengers). Singapore was the first and the final port of call. Other ports were Ko Saui (Thailand) [docked for a day]; Bangkok (Thailand) [Klog Toey docked for three days]; Sihanoukville (Cambodia) [one day]; Ho Chi Minh City (Vietnam) [three days]. Azamara includes tips and house wine for lunch and dinner. For us the attraction was the all-in package (including staff gratuities), though not cheap but very good value. Some fellow passengers were offered by their travel agents money on board as a sort of back-handed discount you have to use up. For our Azamara promotion the travel agent refunded US$500 following the cruise or on booking. The all-in package included air-fare, another reason why we deserted our regular Holland America cruise for Azamara and paid more than we usually do. However there is a catch 22 that didn’t occur to us when booking the flights [all United] arranged by Azamara Club Cruises. We left Chicago [O’Hare] on a 06:30 flight for Los Angeles [this meant, as we live 60 miles from O’Hare, going to the additional cost of booking a hotel at the airport]. From LA we flew to Tokyo and then to Singapore. On the return we were booked early in the morning again from Singapore to Hong Kong and then the long flight from Hong Kong to Chicago. Going and returning we paid extra for United upgrade from basic steerage class. Admittedly Azamara provided a hotel day room at the Conrad Centennial on arrival and departure but in order to accommodate the flights we were forced to get up at ridiculously earlier hours such as for instance 02:30. No wonder our body clocks a week or so post the cruise have still not adjusted. Also upon arrival in Singapore we were exhausted and forced to wait with luggage for an hour or so before being transferred to the hotel owing to a lack of co-ordination at the local level between tour representative and Azamara head office! 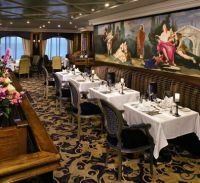 Apart from the shops, the spa treatments and hairdresser, plus a rather limited on-board casino or some of the very well organised shore trips, about the only place to spend money on board was one of the two private dining rooms that offered gourmet themed menus and even finer wines. Whilst we were on board there were Indian or Thai and other themed evenings in one of the two other dining rooms: one more formal than the buffet based other. Formal dress nights were not required. The standard of accommodation and cuisine is very high and with a more than competent choice of complimentary drinks of either white or red wine at lunch and dinner. Indeed not just one glass but continual refills. The cruise was only three quarters full: there had been a fire on a recent Journey cruise and the ship had drifted for several days in potentially hazardous pirate waters. Given that there were 471 passengers on board [majority Americans, large proportion of Brits, Australians, some South Africans, and colourful Brazilians and others] and a crew of just over 400, the atmosphere is like a small village but it is difficult to avoid those whom you wouldn’t otherwise spend the time of day with in real life. Cabin numbers had to be given at dinner in the main dining room so it was not difficult to determine who were in the expensive suites served by a butler with satin drapes and an English style bath. The basic cabins were similar to those on for instance Holland America. The entertainment team worked very hard but was rather limited. There was a jazz ensemble with a fine saxophonist. A harpist performed near the main dining room and a bar at meal times and seemed rather wasted. Indeed larger cruise ships seem more conducive to passengers liking classical music. There was no string trio or quartet. A fine classical pianist performed twice for half an hour or so but was hampered by her inadequately tuned piano and rough seas. The staff were very professional, friendly and multi-tasked. The captain of the ship seemed to spend more time acting in a “PR” capacity speaking to selected passengers rather than actually being at the bridge. As the ship sailed a safety drill was carried out: its informality was appreciated. The Telegraph CRUISE Show takes place in London’s Olympia on 23-24 March 2013. From small boutique river boats to modern resort style ships perfect for the whole family, this is your chance to meet with over 100 cruise lines and specialist operators all under one roof – and have a great day out! Visitors to the March show can get up-to-date insider tips and advice from the experts, attend the informative FREE talks and participate in the exciting panel discussions, discover different ship styles and incredible destinations, find out what’s new for 2013/14 and also save thousands of pounds with exclusive show-only offers! AMAWATERWAYS is introducing four new itineraries in France and Portugal for 2013, cruising the Seine for the first time and returning to the Douro after an absence of nearly two years. The line offers a total of 25 cruise itineraries across Europe, Africa, Russia, Vietnam and Cambodia, and is increasing its fleet to 15 luxury river cruisers with the debut of the brand new AmaPrima in April 2013 on the Danube and the Rhine and the AmaVida which debuts on the Douro in March 2013. The new 164-guest, luxury river cruiser AmaPrima is a sister ship to the innovative new ship AmaCerto (which debuted in April 2012) and incorporates the most advanced river cruise ship design with spacious staterooms, most featuring exclusive twin balconies, a heated swimming pool, multiple fine dining venues, a complimentary internet and infotainment system with 42” flat screen TV, gratis wi-fi and free use of on board bicycles. COMPAGNIE DU PONANT, a boutique French cruise line and 5-star expedition specialist, has just launched a 64-page brochure uniquely dedicated to its brand new Asian itineraries for the winter season 2013-2014. From modern empires to ancient kingdoms, passengers are invited to explore the diversity of a mysterious and captivating continent. NORWEGAIN CRUISE LINES is heavily promoting its latest family liner Norwegian Breakaway which will be based in New York. From May until September on offer will be a series of seven-night cruises to the Bahamas and in the winter 12-night trips to the Caribbean. You can top or tail the holiday with a stay on Manhattan, the centre of the world’s entertainment industry. REGENT SEVEN SEAS CRUISES, has announced news of an exclusive ‘Verona Opera & Cruise’ experience this summer featuring a stunning operatic performance of Giuseppe Verdi’s Aida at the world-famous Arena di Verona in Italy. 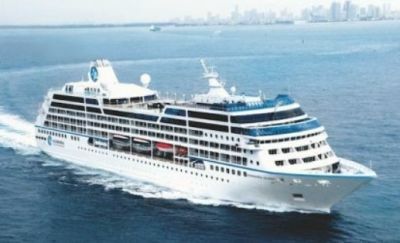 Silver Cloud, 15-19 June, Hamburg to Copenhagen, with calls in Warnemünde (Rostock) and Helsingborg. Silver Wind, 16-20 March, Barcelona to Rome, with calls in Monte Carlo and Livorno. Silver Wind, 14-18 May, Rome to Monte Carlo, with calls in Bonifacio, Calvi, and Livorno. Silver Wind, 11-16 March, Lisbon to Barcelona, with calls in Málaga, Cartagena, and Valencia. Silver Wind, 18-23 May, Monte Carlo to Barcelona, with calls in Sóller de Mallorca, Ibiza, and Valencia.